Word traveled fast in the genealogical community yesterday when it was announced that Ancestry.com had acquired Find A Grave. (Yes, it will still be free.) Find A Grave has grown to be an invaluable database of gravestone images worldwide based on collaborative efforts by volunteers. Frequently, photographs, biographies, and obituaries are included alongside the gravestone images, and visitors can leave virtual tributes. Find A Grave, Inc., Find A Grave, digital image (http://www.findagrave.com : accessed 1 October 2013), photograph, Friedrieka Stube (1843-1891) and Ernst Stube (1839-1879), Memorial Nos. 67992191 and 67992204, Huntley Cemetery, Huntley, Illinois; photograph by Zavada Family, 2012. Did you know that if there is not a photograph of your ancestor’s grave already online, you are able to put a request out to volunteers via Find A Grave? 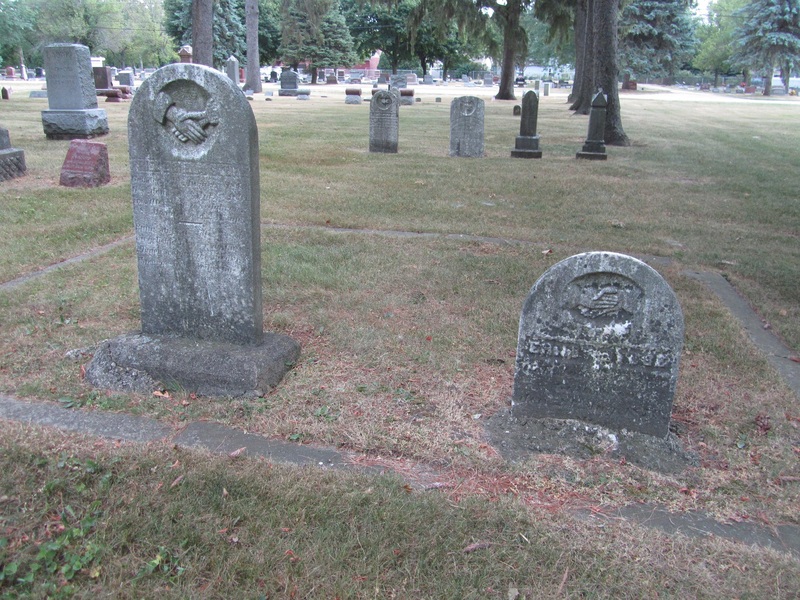 Thanks to a volunteer for the Huntley Cemetery of Huntley, McHenry County, Illinois, I was able to see the graves of my ancestors Ernst and Friederike (Wagner) Stübe from miles away. Do you have a Find A Grave success story? 1 Find A Grave, Inc., Find A Grave, digital image (http://www.findagrave.com : accessed 1 October 2013), photograph, Ernst Stube (1839-1879) and Friedrieka Stube (1843-1891), Memorial Nos. 67992204 and 67992191, Huntley Cemetery, Huntley, Illinois; photograph by Zavada Family. 2 Mecklenburg-Schwerin, Germany, Census, 1867,” Friedrichshof, Ritteramt Gnoien, Mecklenburg-Schwerin, Germany, Ernst Stübe; digital image, Ancestry.com (http://www.ancestry.com : accessed 1 October 2013), citing Mecklenburg-Schwerin (Großherzogtum), Volkszählungsamt, “Volkszählung am 3. Dezember 1867,” Landeshauptarchiv Schwerin, 5.12-3/20 Statistisches Landesamt (1851-1945). 3 “New York, Passenger Lists, 1820-1957,” digital images, Ancestry.com (http://www.ancestry.com : accessed 1 October 2013), manifest, S.S. Silesia, Hamburg, Germany to New York, arriving 12 October 1869, Ernst Stübe; citing National Archives microfilm M237, roll 319. 4 1880 U.S. census, Cook County, Illinois, population schedule, Chicago, Enumeration District (ED) 144, p. 257-C (handwritten), dwelling 25, family 74, Ricka Stüve; digital image, Ancestry.com (http://www.ancestry.com : accessed 1 October 2013), citing National Archives microfilm T9, roll 196. 5“U.S, City Directories, 1821-1989,” database, Ancestry.com (http://www.ancestry.com : accessed 1 October 2013), entry for Ernst Stube; citing “Chicago, Illinois City Directory, 1872 (Chicago: Richard Edwards, Publisher, 1872),” page number not cited. 6 Louise (née Nelson) Wiese to Phyllis (née Wiese) Adam, letter, 2 April 1964, providing information about the family tree; Adam Family; privately held [personal information withheld]. 7 Find A Grave, Inc., Find A Grave, digital image (http://www.findagrave.com : accessed 1 October 2013), photograph, Ernst Stube (1839-1879), Memorial No. 67992204, Huntley Cemetery, Huntley, Illinois; photograph by Zavada Family. 8 McHenry County, Illinois, certification that record was not found, issued 19 July 2012, no death record located for Ernst Stube or Stuve who died 24 August 1879 in Huntley, search conducted from 1877-1905; County Clerk’s Office, Woodstock. 9 1880 U.S. census, Cook Co., Ill., pop. sch., Chicago, ED 144, p. 257-C, dwell. 25, fam. 74, Ricka Stüve. 10 Cook County, Illinois, death certificate no. 16007, “Friedricka Stube,” 3 May 1891; digital image, FamilySearch (http://www.familysearch.org : accessed 3 January 2012). Note: Images no longer available through FamilySearch. 11 Find A Grave, Inc., Find A Grave, digital image (http://www.findagrave.com : accessed 1 October 2013), photograph, Friedrieka Stube (1843-1891), Memorial No. 67992191, Huntley Cemetery, Huntley, Illinois; photograph by Zavada Family. This entry was posted in Tombstone Tuesday and tagged Chicago, Illinois, Stübe, Wagner on October 1, 2013 by Melanie Frick.